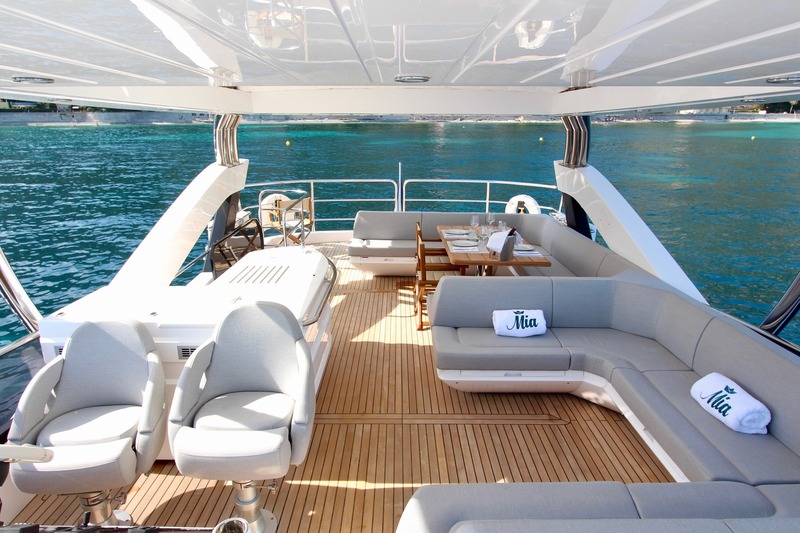 From the swim platform, guests can access the main deck aft where there is a sofa and raised table for alfresco dining in the fresh air at any time of the day. 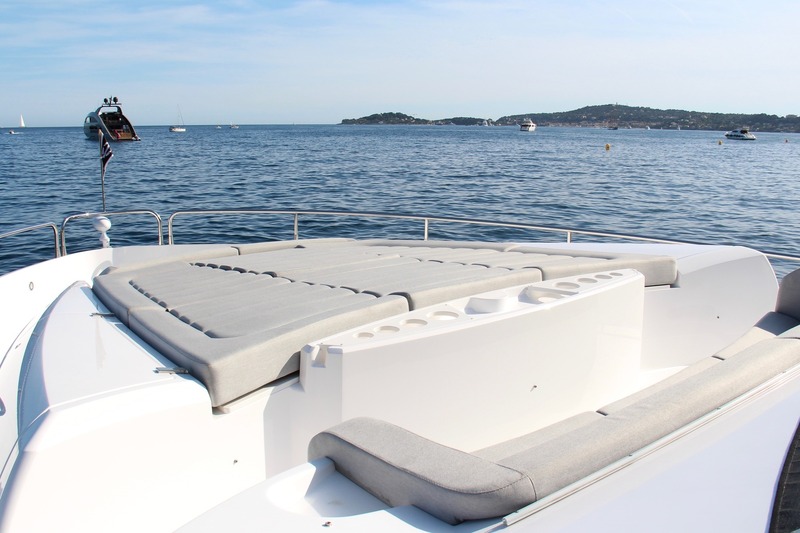 Sunbathers will find a foredeck with a seat and sunpads spread across the bow. 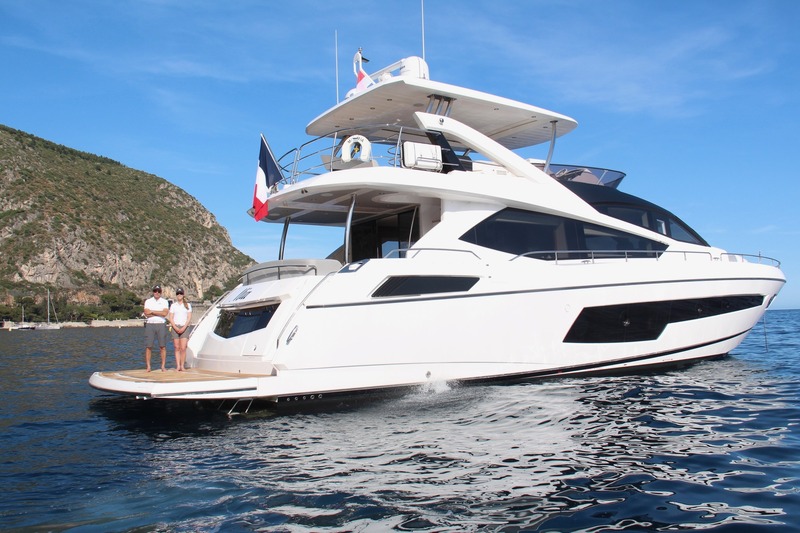 The shaded flybridge offers a C-shaped sofa to the port aft with a raised table for alfresco dining and forward a second C-shaped seating area without a table for unwinding while enjoying the views. Opposite, there is a barbeque grill and the forward helm station. 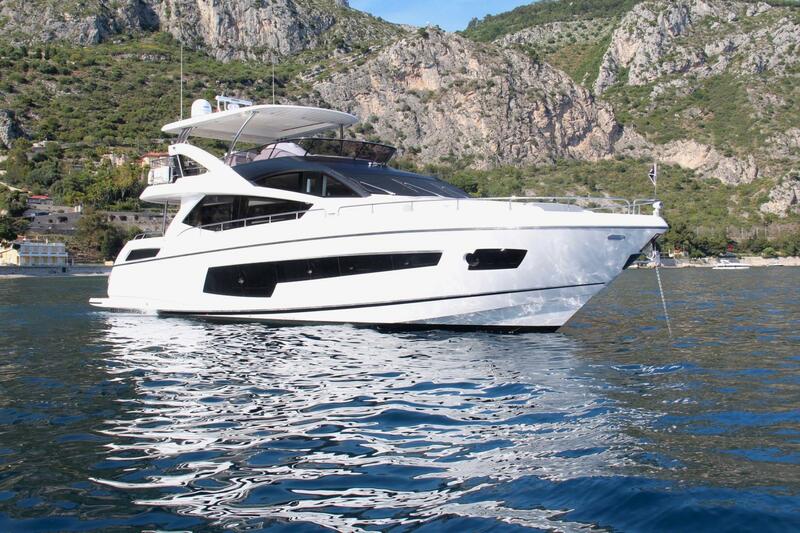 The contemporary interiors from Sunseeker use glossy wooden panelling and ice white furnishings and upholstery to emphasise the interior space. 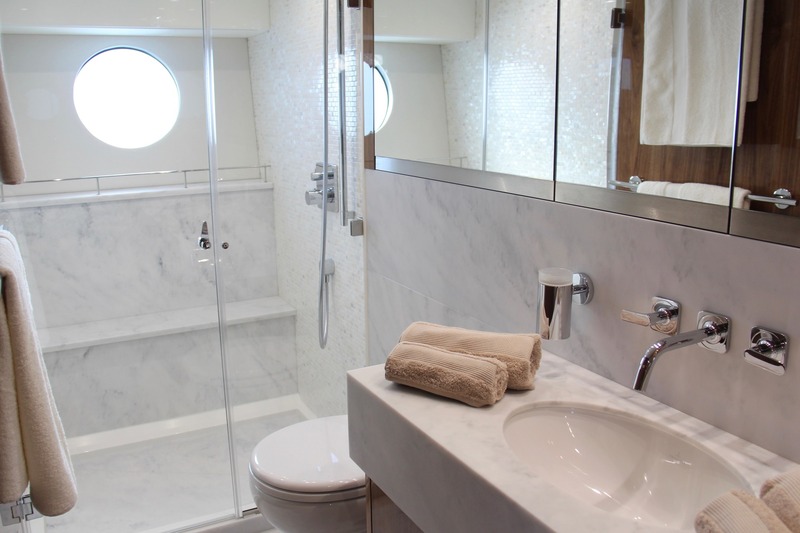 The lower deck provides guests with a Master suite, a VIP stateroom, a double cabin and a twin cabin, all brightly lit by large windows along the hull and plenty of interior lighting. 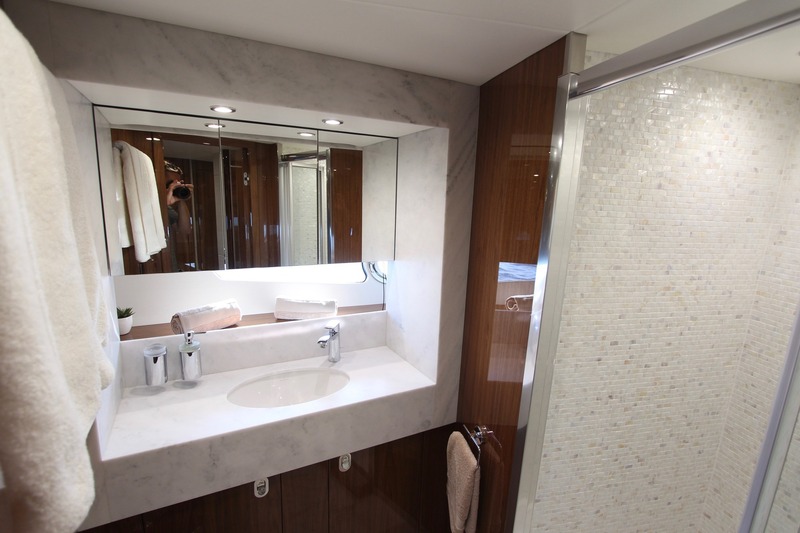 with crew accommodation and facilities also on this floor. 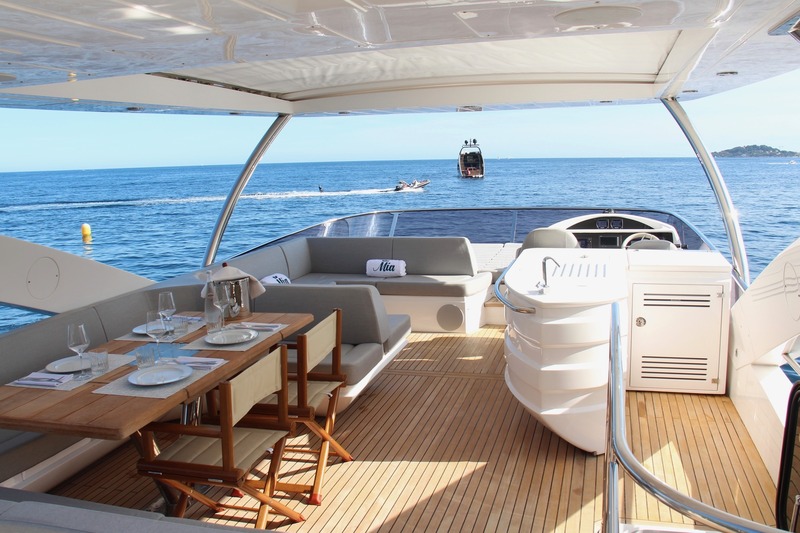 On the main deck, the galley is placed on the port side, leaving the starboard side behind the helm station for hosting the formal dining area to seat up to eight guests. 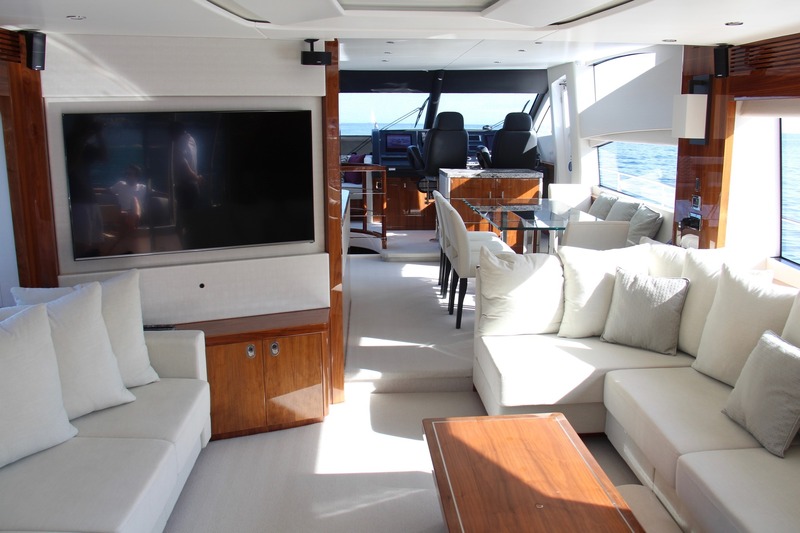 Two large sofas are placed on both sides of the aft interior to form a large and comfortable environment for the group to unwind with a film on the forward widescreen TV. 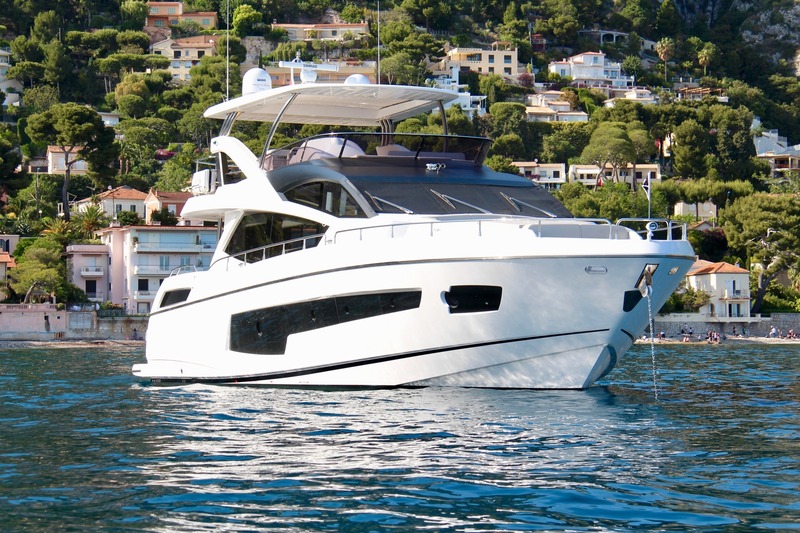 A pair of MAN V12 1,550 HP engines creates a cruising speed of 25 knots and a top speed of 30 knots. Accommodation includes four cabins for up to eight guests. 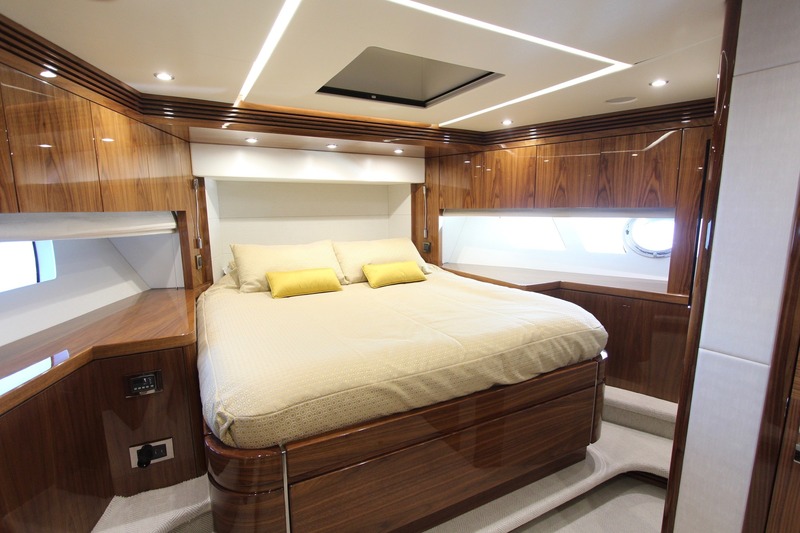 The full-beam master suite is located amidships and features a queen-sized bed, walk-in wardrobe, vanity unit and en-suite bathroom compartment with electric toilet, handbasin and large shower. 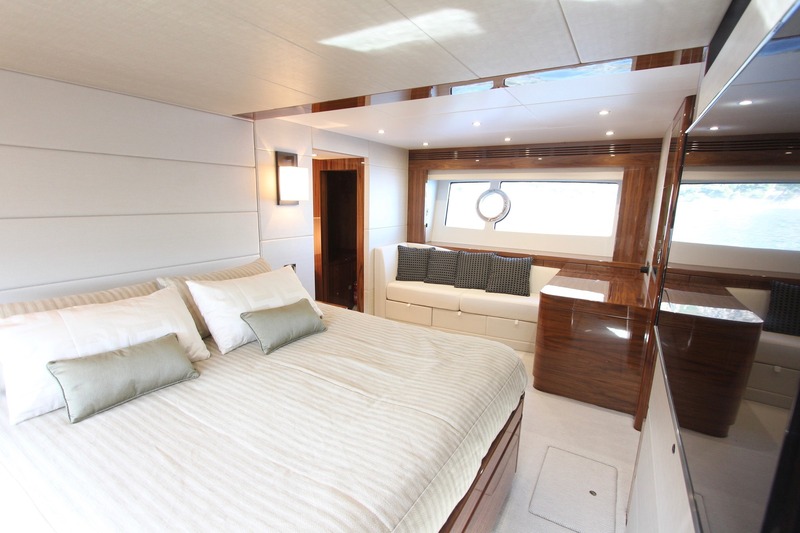 The VIP guest cabin is located forward and features an island double bed, a large wardrobe, a vanity as well as an ensuite bathroom. 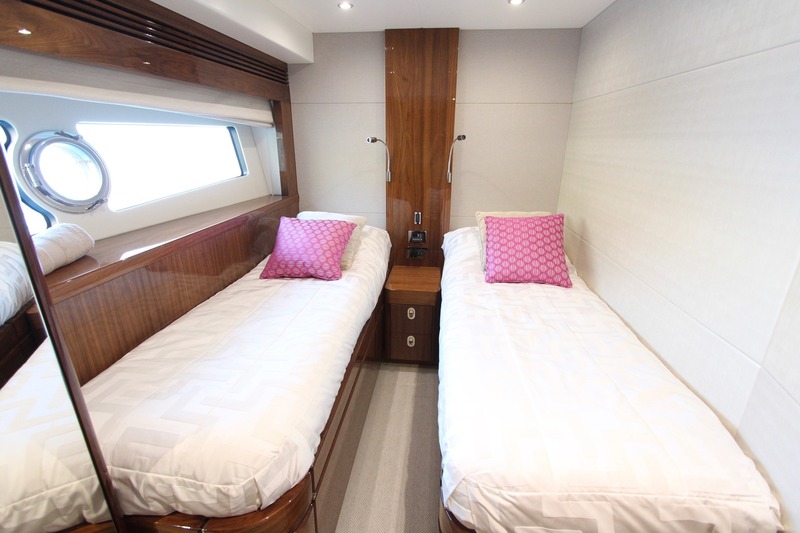 The double guest cabin is located starboard and has an island bed, hanging locker and bedside storage and has an access to an ensuite bathroom used also as a day head. 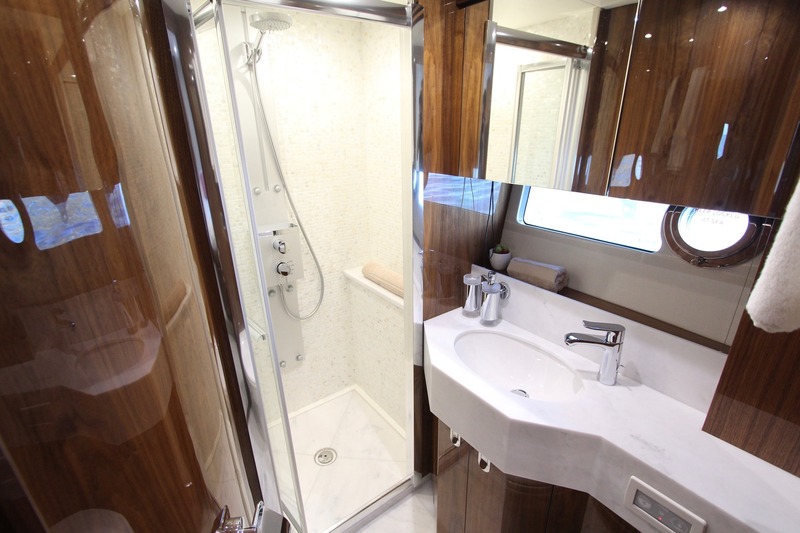 The twin cabin is situated to port and has two large single beds, hanging locker and bedside storage, as well as an ensuite bathroom with shower.